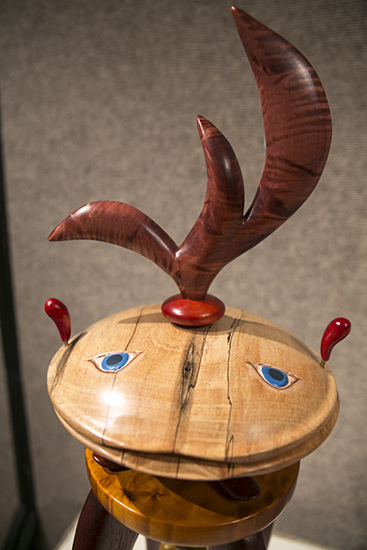 The Samford University Art Gallery is featuring “Whimsical Elegant Wood,” the art of Dale Lewis, Jan. 26-Feb. 25. The gallery is located in Swearingen Hall and is open Monday-Friday, 9 a.m.–4 p.m.
Lewis has created hundreds of whimsical sculptural forms for more than 30 years. He has pieces in six art museum permanent collections and numerous private collections in the United States and Europe. The collection of 40 pieces showcases Lewis’s wonderful imagination and sense of humor. A public reception for Lewis will be held 4-6 p.m. Feb. 10 in the gallery. Cassady Weldon is a journalism and mass communication major and news and feature writer in the Office of Marketing and Communication.